I wish I had enjoyed this more, but when a novel of just a smidgen over two hundred pages takes me more than a week to read, something’s definitely not working for me, and I think I know what it is. 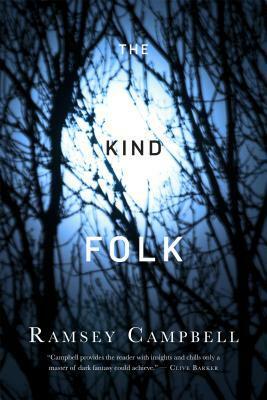 While the premise behind The Kind Folk is certainly compelling, and horror novelist Ramsey Campbell sure knows his stuff when it comes to creating dread and suspense, I nevertheless had a difficult time getting used to his writing style and technique, which ultimately affected my overall enjoyment of the story and its characters. Of course when it comes down to an author’s writing style, each individual reader’s mileage may vary, so you may still wish to give this book a try if the story sounds like something that would interest you. Imagine finding out you are not who you’ve always thought you were, and for the moment to play out on television in front of a nationwide audience. Luke is a 30-year-old standup comedian who along with his parents Maurice and Freda are called up to appear on Brittan’s Resolutions, a fictional Maury-like British daytime talk show which specializes in paternity tests. Maurice has long held suspicions that his son was actually fathered by his brother, Luke’s uncle Terence, and so the whole family has been subjected to a round of DNA testing. The results? Terence is NOT the father! Queue the collective sighs of relief and tears and joy. But before the congratulations can go around, the host drops another surprise: Maurice, you are also NOT the father! And yet, it’s the final bombshell that stuns everyone: DNA shows that Freda isn’t Luke’s mother either. Reeling from the news, the family concludes that a mistake must have been made at the hospital when Luke was born, and somehow babies have been switched. Luke thus begins his quest to track down his biological parents, hoping that the knowledge would shed light on his medical history because he and his girlfriend Sophie are expecting their own baby very soon. He begins by approaching Terence for help, since Luke has always been close to his uncle, but Terence’s sudden death puts an end to that plan. Instead, Luke searches for clues in Terence’s journal, which the older man had filled with rambling, disjointed notes on his obsession with mythology and the occult going all the way back to a time just before Luke was born. Terence had written about going to various locations around Britain seeking something, with the words KIND FOLK cropping up in the journal more than a few times. At first, Luke takes this to mean that the locals Terence met were nice and helpful, but as he traces his uncle’s steps, he begins to see strange unsettling things, and more than once he could have sworn he saw an inhuman creature following him out of the corner of his eye. The mentions of “Kind Folk” of course were references to Faeries. These are the real scary ones too, and not your Disney-fied versions or even the beautiful, cruel tricksters you often see in urban fantasy. The ones in this book are so, so, so much worse. They don’t even look entirely human, with their elongated limbs and pale shapeless faces bearing a poor facsimile of regular features like eyes and mouths. The book also describes them doing this hideous thing with their hands, and I don’t know why, but there’s just something so hair-raisingly disturbing when it comes to extreme bodily contortions, which is probably why exorcism movies employ this device so much. While there were times where I wish there had been more “horror” in this story, especially during sections where the plot meanders, this novel definitely had its terrifying moments, and almost without exception those scenes all involved the Folk. Whenever they appear, things immediately become creepy as hell. At the heart of this book is also the Changeling myth, based on old folk tales about how the Fae steal newborn babies by replacing them with a doppelganger who is one of their own. This is obviously relevant to Luke’s situation, but with the impending arrival of his own child, there’s this further sense that time is running out, adding a layer of suspense and dread as the baby’s due date ticks closer and closer. Now for the main reason why this book didn’t work as well for me: Campbell’s writing has a very stark, bare-bones quality to it, with very little description. Coupled with a heavy reliance on dialogue, certain scenes can be difficult to follow. A character will say something, often without accompanying context, leaving me guessing at what he or she means by that. At the same time, when the author does describe the physical environment, he would sometimes use overly complicated clunky metaphors used to relay very simple ideas. Hard as I tried, I also couldn’t get into the characters. There’s barely any emotion to them, and they seem to treat major events like any other normal day. A husband accuses his wife of being unfaithful, to the extent they all have to appear on a national daytime talk show to sort it out, and the next day they go just back to being a regular old married couple with all the tensions and marital conflicts forgotten. Luke’s uncle Terence dies, and everyone treats it with the gravitas of a trip to the mall. I also didn’t like Luke very much. He barely had a personality, even though he’s supposed to be a very successful comedian, charming audiences with his talent for imitations. His reaction to the DNA results also made me want to punch him in the face. Blood parents or not, for thirty years they raised him and loved him, but suddenly with the snap of the fingers it’s not “Mum” and “Dad” anymore, it’s “Freda” and “Maurice”—and he even goes as far as to change this for their contacts in his phone! I mean, SERIOUSLY, LUKE?! But of course, Freda and Maurice’s response to all of this is the equivalence of a shrug—no sadness, no anger, no hurt, no nothing. The Kind Folk could have been a real winner, and certainly it contained all of the right ingredients. Unfortunately, it was the execution that really fell flat for me. With all these great ideas here, this novel could have been one of the most terrifying books I read this year, but while it did indeed have its frightening moments, the horror never really sustained itself due to some untidy plotting and weak characterization. If you can get into the writing, this would be a really fast read though, and might be worth a look if you want a book about some truly terrifying Faeries. Just the description of this rubs me the wrong way. It seems all over the place. This one is not for me. I actually thought the concept behind the book was really interesting. I didn’t so much like writing style or the execution though. Interesting, horror with little description. I mean, I guess I’ve probably read some that worked well, but seems like that could be hard to pull off. The prose just seemed very sparse. I’m not sure if more description would have been better, but it definitely would have made the story easier to follow. Oh not my son, then forget him…srsl?! I just could not get behind the characters’ reactions to some of these developments. Not convincing at all. I could not get into the characters at all! I think that was the last straw. Hmmm this does sound iffy. I think the lack of emotional responses to the major revelations would’ve annoyed me as well. Especially that the main character was able to just basically flip a switch and start thinking of the people that raised him as not his parents. Sorry to see this one didn’t work that well for you. I would’ve hoped for more out of a Changeling inspired story too. The character’s reaction just seemed to ungrateful to me! One DNA test doesn’t magically make them different people or erase the last thirty years. It just seemed like such a strange, callous thing to do, to suddenly treat his parents as less important as they were.